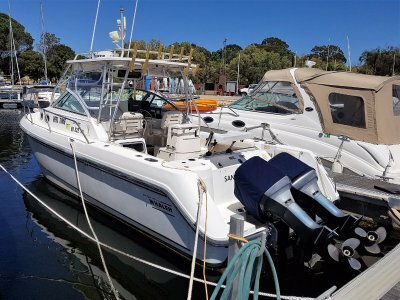 The owner is keen to sell as he has his eyes on the next boat. I would be happy to present all sensible offers. Are you a CAT LOVER ? Calling all Ailurophiles, yes I had to look that one up as well. My wife said that the next boat we buy had to tick all the boxes.... I've ticked all mine ! 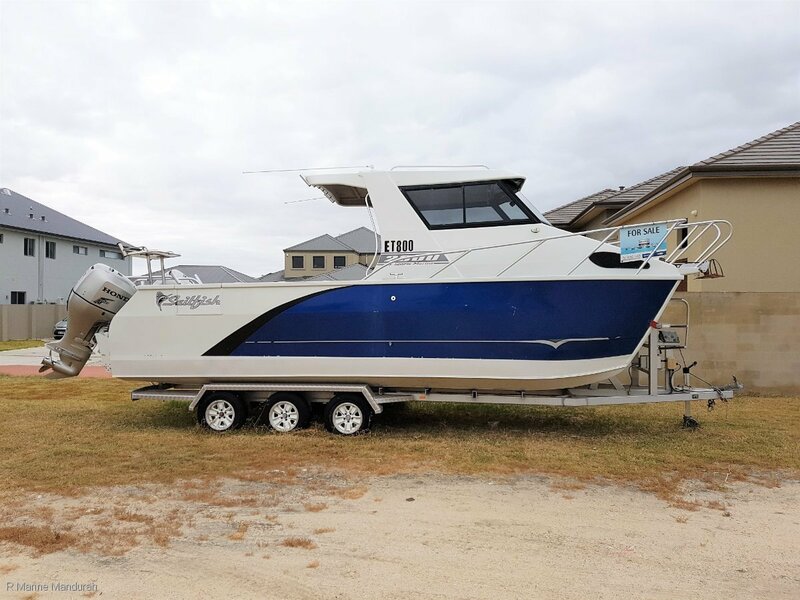 With the Sailfish name held in such high regard I am thinking this 2800 Platinum Series 1 will not be on the market for long. Having a replacement price tag starting from around $250,000 for the current model the listing price is pretty attractive I would have thought. For the serious offshore adventurer the 2800 Sailfish offers around 3m of deck space and with the optioned 2.8m beam there is plenty of room here to land some serious piscatorial delights, with added features like the full length side pockets for tag poles or the Serious gaff, partially recessed welded grab rails when rolling over a heavy sea, welded aluminium rod holders so you know the rod will be there after a serious strike and easy access transom door not to forget the Starboard side custom dive access door and more. Whats not to like ? Step up to the raised helm, no water getting up here while backing down hard on a large fish. Quality helm seating is backed on the port side with a recessed ice chest under the padded squabs and to Starboard a large storage bay and washdown sink. Your Isotherm fridge is cleverly mounted here as well so you are never to far from a cold drink. A full hardtop extended partially over the cockpit is an ideal feature on this style of boat, plenty of room to stay out of the sun on long days at sea. Open the helm windows and let the breeze flow through. Offering a wide and deep dash area there is acres of room for any additional gear you might want to mount, maybe the GOPRO mount to capture the action. Currently fitted with Furuno GPS and Sounder along with the standard Honda gauge set the helm is clean and clutter free. 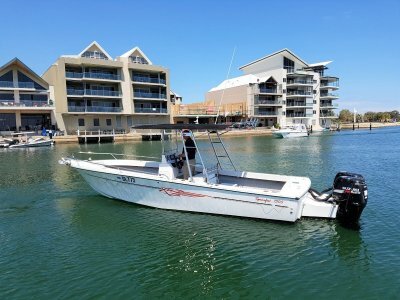 Unlike some cats on the market the Sailfish offers an aluminium lockable cabin door, a bonus when heading up North or relaxing at Rotto giving you safety and protection for your valuable belongings. Now this is where I may have ticked the boxes for my wife, well maybe one box.... Opening the forward cabin door you are greeted with a decent forward berth, Toilet and shower facilities. I'm a tall person and while there is not full head height in the Sailfish cabins it is suitable for what a fishing trip to the Abrolhos may require. The toilet may win the day with the family ? Currently wearing a pair of Honda 150 Hp fours stroke outboards with a reported 200 hours of use, hydraulic steering fitted to each motor, she is young at heart with years and years of boating ahead. Residing on a Sailfish Custom tri-axle trailer with ALCO suspension rated at 3500kg and electric hydraulic beak away brakes, 14 inch tyres, the wide open roads are beckoning. This boat needs to sell and all resonable offers will be presented. 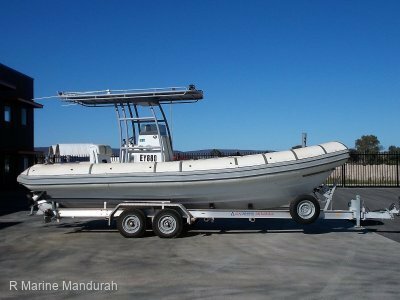 Pick up your phone and call the Team at R Marine Mandurah NOW to arrange a time to get yourself on board this 2800 Sailfish Cat. Call the office on 9583 5355 or Paul on 0427 949 293 or Cruze on 0456 949 293 TODAY!